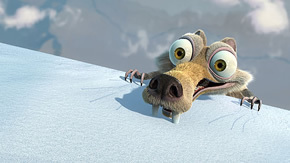 Publicity Stills of "Ice Age: The Meltdown"
To begin with, there are at least 6 CG animation movies in the release pipeline this year and the sequel to the 2002 hit, “Ice Age” is the first to hit the theatres. 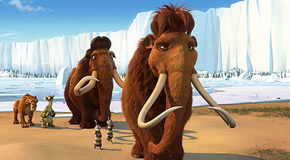 In “Ice Age 2: The Meltdown”, our heroes Manny, Sid and Diego is heading for new ground as the warming climate is breaking a huge dam. Talk about global warming. Along the way, new friends are bond including another mammoth named Ellie (voiced distinctly by Queen Latifah) and her 2 mischievous possum “brothers”. One of them named Crash which is voiced by Sean William Scott (American Pie Trilogy). So there you have it, a brand new adventure, new characters with the original cast and crew back in tow. 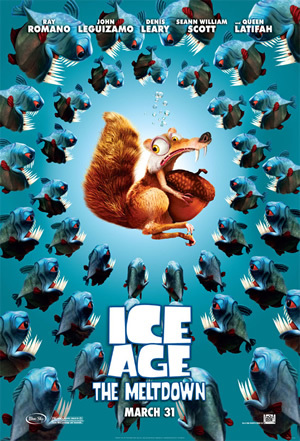 And yes, the lovable acorn-obsessed part rat-like, part squirrel-like creature, Scrat is back to tickle you with its slapstick antics. Well apparently, this silent creature always has a way with audience. Oh, if you hate the song routine in “Madagascar”, there’s one in “Ice Age 2” that rivals the jungle tribal MV in the latter. Think vultures and food. While the sequel has a livelier feel in terms of pacing minus the awkward caveman and mushy children stuff as compared to the first, the sequel however still lacked the soul and layers of good storytelling. There’s too much reliance on the slapstick factor and our main heroes “sound” a bit bored with little to do except helping Manny the mammoth falls in love. While you might urge that this movie is primarily targeted at preteens audience with it’s digestible wholesome story, but hey the adult group needs to be entertained too. PIXAR has always been the leader of the pack with their state of the art technology and a way with genuine story plotting. DreamWorks scored mainly on the CG technology side. Guess Fox/Blue Sky who produced the “Ice Age” series has to settle for the third spot, as their productions are neither advanced nor outstanding in both areas at this point of time. But credit still has to be given to Fox/Blue Sky for their improving CG technology, just pay close attention to the highly photo-realistic fur on the creatures although it’s hard to imagine the hard work behind those “fake” fur. With the increasing popularity of CG movies and the fast setting up of animation effects houses, it’s advisable for Fox/Blue Sky to quickly establish a further permanent foothold in the arena. To start with good storytelling might be a feasible suggestion.